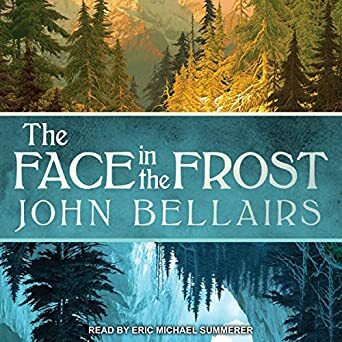 John Bellairs is most famous for his novel The Face on the Frost. All of these novels are mystery/horror/fantasies suitable for children. Later books (after 1990) were coauthored with Brad Strickland who continued the series after John Bellairs’ death. There are excerpts and plenty of other information at the John Bellairs / Brad Strickland website. Lewis Barnavelt — (1972-1993) Ages 9-12. Publisher: Lewis always dreamed of living in an old house full of secret passageways, hidden rooms, and big marble fireplaces. And suddenly, after the death of his parents, he finds himself in just such a mansion — his Uncle Jonathan’s. When he discovers that his big friendly uncle is also a wizard, Lewis has a hard time keeping himself from jumping up and down in his seat. Unfortunately, what Lewis doesn’t bank on is the fact that the previous owner of the mansion was also a wizard — but an evil one who has placed a tick-tocking clock somewhere in the bowels of the house, marking off the minutes until the end of the world. And when Lewis accidentally awakens the dead on Halloween night, the clock only ticks louder and faster. Doomsday draws near — unless Lewis can stop the clock! This series was started by John Bellairs and finished by Brad Strickland. 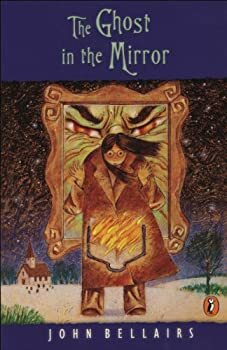 I may not be the best person to review John Bellairs' The Ghost in the Mirror, since it is clearly one book of many in a series, and I've only just arrived. When I picked up my copy from the library, I had no idea that it was part of a larger set, when in fact, Bellairs has written sixteen books that contain the characters found within this book. Johnny Dixon — (1983-1994) Ages 9-12. Publisher: A mysterious stranger gives Johnny Dixon a magical ring that plunges him into a terrifying adventure during which he must outwit the ghost of the mad Father Baart. Anthony Monday — (1978-1992) Ages 9-12. Publisher: Fourteen-year-old Anthony Monday of Hoosac, Minnesota, and his friend Miss Eells, the Hoosac librarian, try to stop an evil wizard from turning the world into an icy wasteland. The Pedant and the Shuffly — (1968) Ages 9-12. Publisher: The evil magician Snodrog ensnares his victims with his inescapable logic and transforms them into Flimsies (stained handkerchiefs)…until the kindly sorcerer, Sir Bertram Crabtree-Gore (Esq.) enlists the help of a magical Shuffly (Latin name: Scuffulans Hirsutus)… and Snodrog meets his match!voices in young adult fiction.